Posted by: Stephen Foster in Advertisers, Agencies, Creative, Finance, Media, News April 18, 2018	Comments Off on Did departed Sorrell push too hard to make WPP too big? In a digital age it’s always useful to remind oneself of the standard of the best print journalism and the New Yorker (now online too, of course) is a good place to look. Here’s author Ken Auletta on Sir Martin Sorrell, ex-head of WPP. It shows that Sorrell is a child of his time and upbringing. 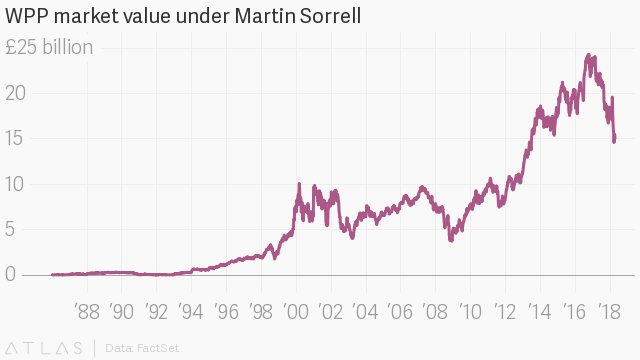 Sorrell resigned from WPP last weekend after a 32-year stint as founder and CEO. This week we can expect to see much speculation about the reasons for his resignation post WPP inquiry, which WPP seems determined to keep a secret. These look likely to be personal although business will clearly play a role. On the latter here’s an analyst’s chart of WPP’s market value over the past decade or so (2008 was the financial crisis) showing WPP’s almost staggering recovery – the reason behind, among other things, the vast pay-outs to Sorrell. Sometimes, though, companies run “too hot.” The same was said of Tesco in the post Terry Leahy era, which demanded some radical surgery by incoming boss Dave Lewis. Whoever the new boss at WPP is may have to take some similar decisions.